I am so thankful for the many ways we have to express our missionary zeal! We are collecting soap and sugar as a way to help the Georgia Baptist Children’s Homes and Family Ministries. The Children's Home is a wonderful ministry to children who need a loving home. As we gather these items, let's pray for the children who are helped by this ministry. Armstrong believed in missions, and 100 years before Facebook, she started her own social network to raise funds for missionaries throughout the world. 100% of the money given to Annie Armstrong goes directly to the mission field. The first year Annie and her group of ladies raised $5,000. Last year Baptists raised over $56 million to go to the mission field! …Annie believed in Christ with all her heart, but it was her hands that expressed that belief in tangible ways. She spent a great amount of time typing and handwriting letters in support of missions. Many of these letters were quite lengthy and all were filled with conviction that more could and should be done in our mission efforts. In 1893 alone, she wrote almost 18,000 letters! Annie also never hesitated to use her hands to reach out to hug a child or distribute food and clothing and the Word of God to those in need. Her hands held her own Bible as she studied to know how best to share Gods love with others. And, most important, Annie was a woman of prayer, folding her hands in prayer to intercede for the missionaries and for those they were helping discover Christ. What a fantastic February we had! My mind and heart are still reeling with the memories of the Souper-bowl, the Keenagers Valentine dinner, the amazing prayers we had for many, and the miracles we saw. I thank God for so many Prayer Warriors in our midst! wonderful! Without our great volunteers, we could never have things like VBS, Keenagers, Sunday School, or even Sunday Service! We have volunteers cooking, cleaning, singing,teaching, setting up, taking down, teaching Sunday School and Kid ROC, and every one of them is praying for not only what they are involved in directly, but they always tell me how they are praying for the church as a whole! What an encouragement as we look forward to March! Welcome to Steve McDowell, new member by profession of faith and Baptism. It seems like nowadays, we have had several come to us first as great volunteers, then as new members! This is the case with our new Brother Steve! He has always been around to help move something or clean up after an event, and even as a volunteer in the Exceptional ministry! Steve has a heart for others and is always ready to help. As we continue to study in Mark, I hope all of you have had a new understanding and love of the beauty of the gospel message. There is so much to love about our Lord, and his word! Joshua 1:8 says: "Keep this Book of the Law always on your lips; meditate on it day and night, so that you may be careful to do everything written in it. Then you will be prosperous and successful! What a great time we have been having in August! A little rain came our way during the Block Party, but I don’t think anyone really noticed! The music and fun went on anyway! I want to thank the Kid Rock Team, the Deacons, and the Hospitality Team for setting up, cooking, cleaning up and all the other stuff it takes for a great church event! Everyone who came had a good time young and old alike! Our visitors were excited to meet us and we were excited to meet them! More and more visitors are appearing in our midst, we praise the Lord for them and welcome them back to our family! August 23rd begins our ROC ministries! ROC stands for Recreation and Outreach Center; (mostly I just call it the Gym!) The younger Kids have Kid ROC (Missions, Music and AWANA) and the Middle and High School have ROC house Worship Arts, Missions, and Bible Study) All of us have Fun with Games and God at the ROC! What a blessing it has been preaching about wisdom this summer. It is helping me to make better decisions, and I hope it has had the same effect on you and your family as well! We all face a multitude of decisions every day, and as Christians we need to make our decisions, not based on what is popular, but what is right. I have never seen anyone regret making a right decision. Sometimes it’s hard to do at the time, but it always is better in the end. Most people know the first part of Psalm 46:10 (Be still and know that I am God), but don’t stop reading there! The rest of 10 and 11 are equally inspiring! “10 Be still, and know that I am God: I will be exalted among the heathen, I will be exalted in the earth. 11 The Lord of hosts is with us; the God of Jacob is our refuge.” To know that God is our refuge, and that He is with us all the time is one of the greatest revelations of the Bible! Find your refuge in Him today! Bring Your Own Children's Sermon! As I walk around the preschool and nursery area I am seeing changes happening before my eyes! 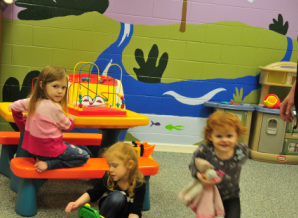 Murals are being painted, new beds, toys, and equipment are appearing weekly! I can tell that everything has been done with an eye for safety,ease of cleaning, and fun for the babies and toddlers. I hear that all the baby and toddler rooms are being redone one by one to make them more inviting for the children, and more welcoming for new families! I am so proud of all of our volunteers that have been working overtime to make Hilton Terrace Baptist Church a place where children and adults alike can hear the good news in a safe and friendly environment! Luke 18:15-17 tells us: Now they were bringing even infants to him that he might touch them; and when the disciples saw it, they rebuked them. But Jesus called them to him, saying, "Let the children come to me, and do not hinder them; for to such belongs the kingdom of God. Truly, I say to you, whoever does not receive the kingdom of God like a child shall not enter it." Mark and Jane have a moment! 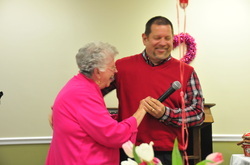 The Keenager's Valentine feast was a great time of fellowship! (Go to our Facebook page for all the pictures! )The staff and their families decorated and prepared a full plate of fun! As we entered a room filled with hearts and chocolates, we served ourselves from a full buffet. Bro John and Bro Curtiss had been hard at work in the kitchen! Amber and Ronny served refreshments and made sure everybody got everything they needed. Mrs. Vicky Blaxton had done an wonderful job on decorations and Mark sang love songs from many eras and genres. At one point, he even got Mrs. Jane Park up and commenced to sashay her around the room! Smiles and good hearted laughter were all around us on that night! What a pleasure it is to be a part of Keenagers! Ecclesiastes 4:9-10Two are better than one, because they have a good return for their labor: If either of them falls down, one can help the other up. But pity anyone who falls and has no one to help them up. 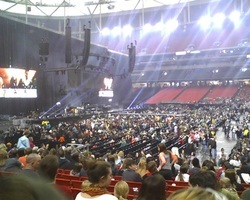 Our view in the GA Dome! What a great adventure we had at Winter Jam this year. We left a little after 9am and got to The Georgia Dome parking lot at 10:30am. From there we spent a couple of hours in the Winter Jam Fun Zone playing games and getting free stuff. I even saw some of our youth interacting with college recruiters so it was well worth the trip to help our youth began to see that God’s plan for their lives extends beyond high school. After the Fun Zone we split into two groups: one group went to the CNN Center to eat while another group ate just outside the gates saving a place in line for a chance to get good seats. We played games while waiting and finally the gates opened and those seats were good. The music was diverse and great for all to hear. And the messages of encouragement and salvation were right on target for our youth and adults who went. We had a chance to hear 12 different musicians and two speakers. We even had a chance to watch the Famous Wallenda tightrope across the dome, pretty cool. 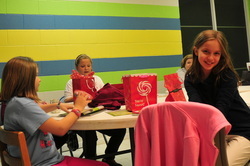 We came back to the church and had a lock-in filled with more food, fun, and games. The next morning all the youth at least made it through the worship service before crashing the rest of the afternoon and evening. God is good! Wow! People have been busy around here! I look around the educational areas and see new paint and different furniture. The children were so excited to see their "new" rooms. I truly appreciate all the volunteers in the children and preschool areas who have been working so hard to make their space a welcome environment that will excite young minds into learning and having fun! I am so glad to be part of a church that loves children and looks for ways to show that love! The children of HTBC are a blessing to this congregation, and my prayer is that each child who is part of our children's ministry will look back and say that this was a church where they saw evidence of God's love. Tyler was briefly made President of the United States at the Relay for Life Kickoff! He has been on the Relay team since we first had one 5 years ago! In fact he has served as Captain or Co-Captain each year we have had a team! His burden for Cancer stems from a childhood friend who died of leukemia. He was the youngest team captain Columbus has ever seen when he first started as a 10 year old! HTBC not only has a burden for cancer victims, but we also want to share with our community the ultimate healing for Cancer and all disease--a relationship with Jesus. Isaiah 53:4-5 tells us that "By His stripes we are healed." A great comfort to all those who suffer and need to invite Jesus into their hearts to comfort and heal them. I am so glad for all those who want to reach out to the community and share the Good News--Jesus Christ wants to be the Lord of your life! Twas the Sunday Before Christmas! 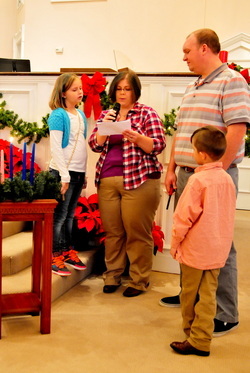 The Hodges Family Lighting the Advent Wreath! The Sunday before Christmas is always a great time to reflect on all the wonders of the season. The worship, fellowship, ministry and prayer we have had recently has been so inspiring! Each of our worship experiences has really focused our hearts on the Christ of Christmas When I think of the past few Sundays and Wednesdays, I look forward to what the spirit has in store for us in the future! Candy Cane Lane was a great success! Everyone from the craft show vendors to the Clean-up crew had a great time and is looking forward to next year’s Christmas Festival! Santa personally told me how much fun he and Mrs. Claus had meeting all of our children! I am sure that none of our kids will be getting coal in their stockings this year, much to the chagrin of Mr. Scrooge! I want to share heartfelt thanks for the whole CCL Team for laying a great foundation. We are looking forward to the return of CCL next year. What an amazing Sunday of worship we had Sunday last! I want to thank the Turner and Standford families for leading us in worship through the lighting of the advent candle. I look forward to the Mosley family leading us in lighting the candle this week. And wasn’t the musical featuring the HTBC choirs fantastic Sunday evening! I want to thank Mark, Mrs. Ronette, Kathy Dean, and all that took part in the leadership of our worship choirs. We were all so excited and proud to see the children and the adults leading us in worship through music! It looks like we will be enjoying great musical worship for generations to come! At this time of the year we make a special missions offering that goes to all of our Foreign Missionaries. It is named for a very special lady who gave her life serving in China. Her name is Lottie Moon, and although she died over 100 years ago, her story is still inspiring people to give to overseas Missions. I know all of us want to continue to support Missions in a real way this Christmas!